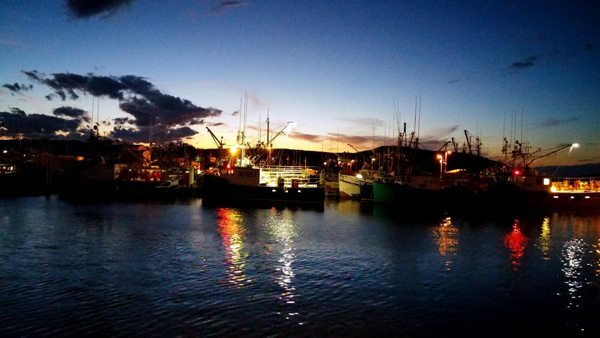 A glorious pictorial Maritime Road Tripping tour of Nova Scotia & New Brunswick via fishing villages, spectacular coastlines, seafood galore and libatious finds! I know, my title is technically false. How can anyone overdose on lobster! I was so happy to devour luscious lobster in some form for 6 out of my 9 travel days. I would have to say instead I had to face lobster withdrawal once back to routine and reality! Today I plan on overdosing you on pictures! Very few wordy paragraphs, instead you will get loads of pictures with a quick commentary. Enjoy! 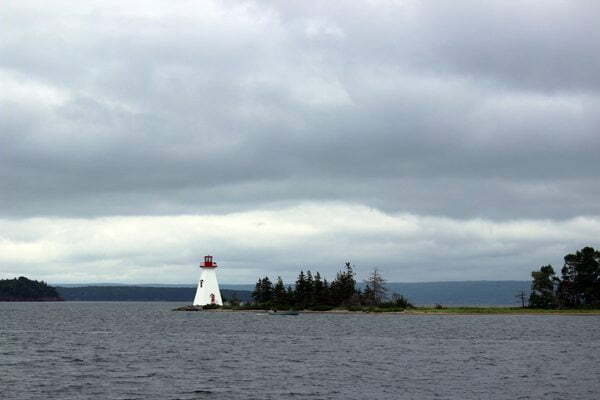 After 2 days of driving, we arrived on the island of Cape Breton. 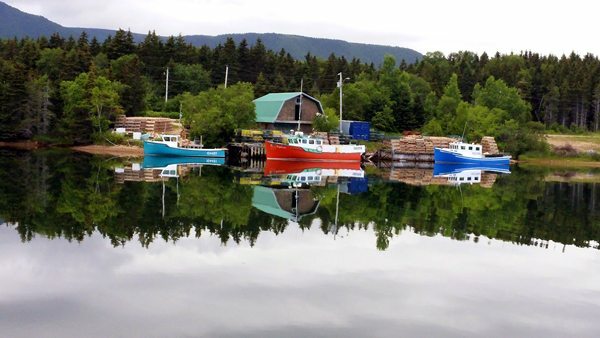 A view from Baddeck! 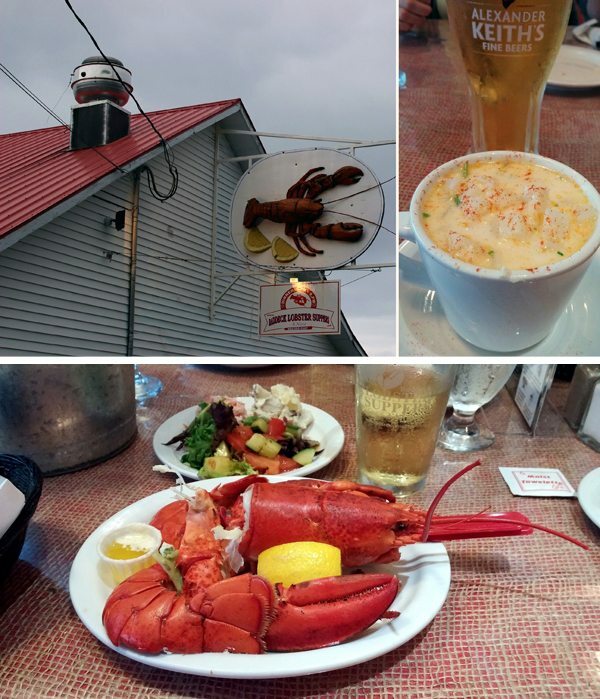 First lobster dinner at Baddeck Lobster Suppers with a seafood chowder and NS drinks or course! Next day we have to make a pit stop to take an antler photo, we have found our moose inner selves! 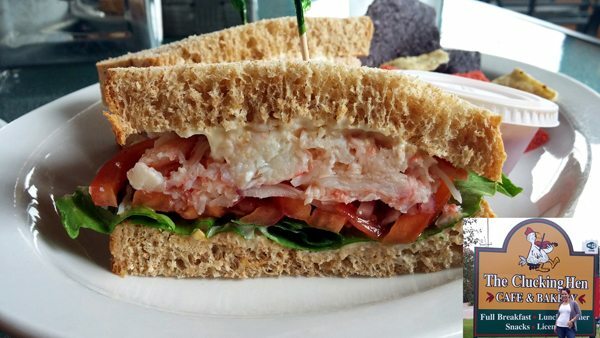 More seafood chowder and a crab sandwich at the Clucking Hen Cafe and Bakery. 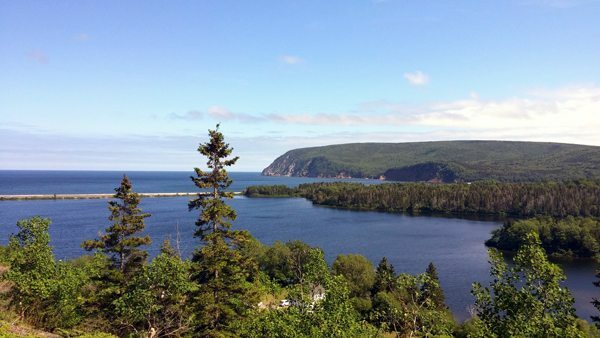 The Cabot Trail is a highway and scenic roadway in the Canadian province of Nova Scotia. 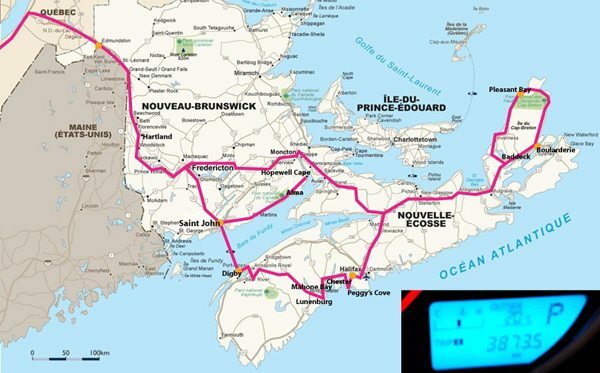 Enjoy the 298 km (185 mi) scenic drive through the Cape Breton Highlands. The western and eastern sections follow the rugged coastline, providing spectacular views of the ocean. Give yourself a minimum of 2 days! 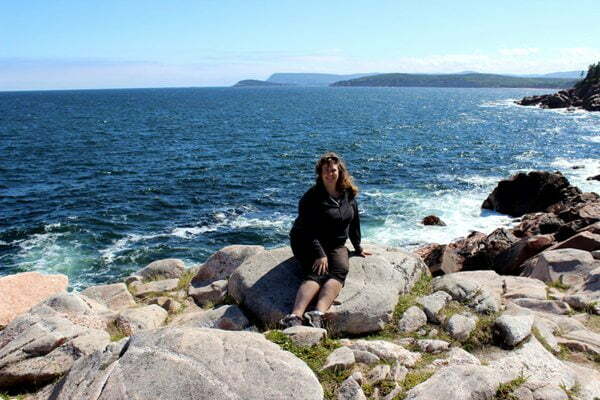 If you love this raw natural beauty, you should also check out my post on Acadia National Park Maine. 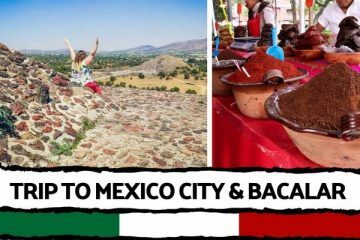 Plenty of arts and crafts, observation points, hiking, and places to dip your toes in the water. 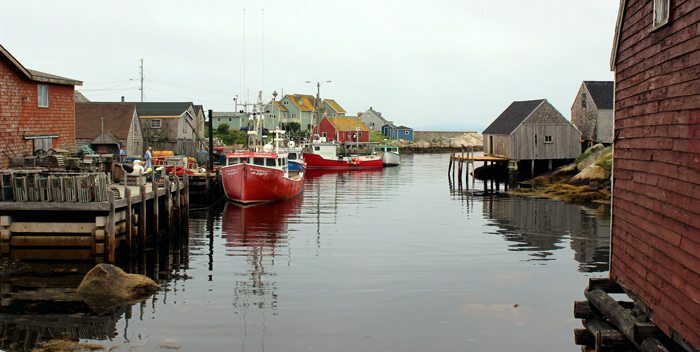 Drive through sleepy fishing picturesque villages. This one was particularly gorgeous with calm reflective waters. We saw moose! 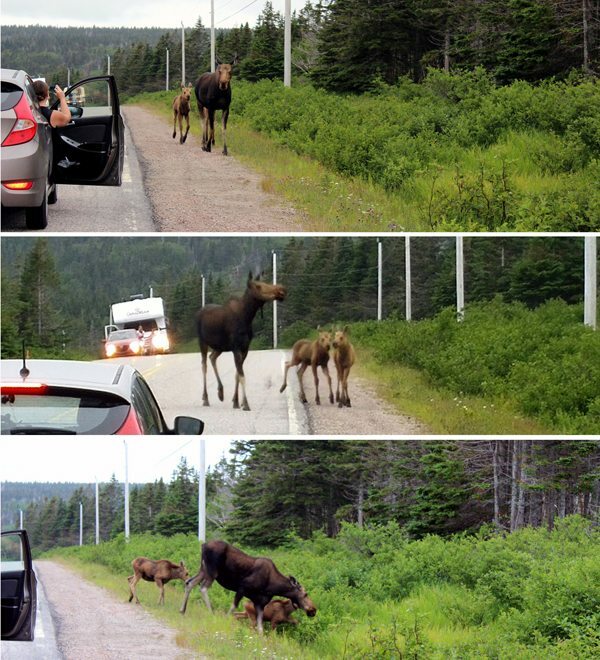 Yes a real mommy moose with 2 babies stopped traffic for a few minutes. Impressive beasts! 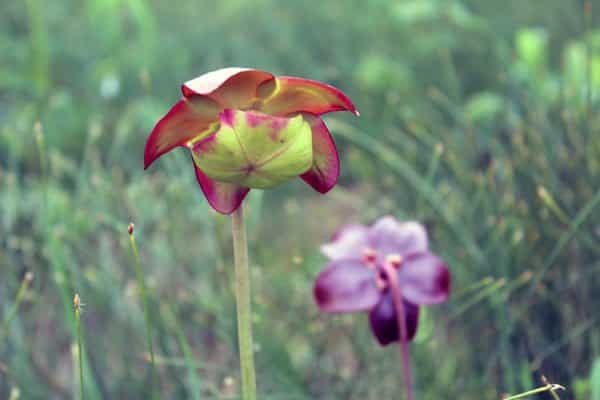 A short hike on the leisurely Bog Trail known for a rugged plateau landscape, exotic orchids andinsect-eating plants! 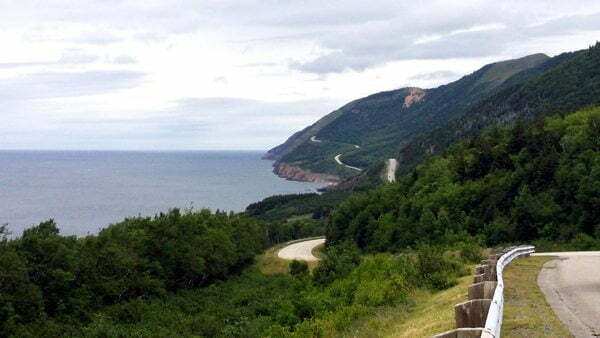 A great shot with the road following the jagged Eastern coast of the Cabot Trail. Proud to be hookers! 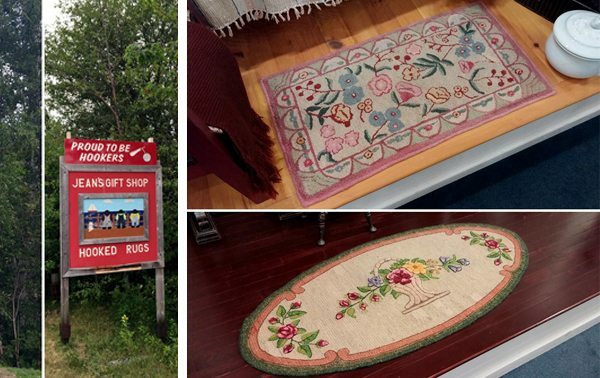 The Acadian town of Chéticamp is world famous for hook rugs. Les Trois Pignons little museum is so worth the stop. Acadian can be hard to understand, it is an old language which is made up of about 60% French and 40% English, sort of like the Cajuns. Veering off onto the Ceilidh Trail, this place is more Scottish then Scotland. No lie, some lost tradition from the mother country still live on here. 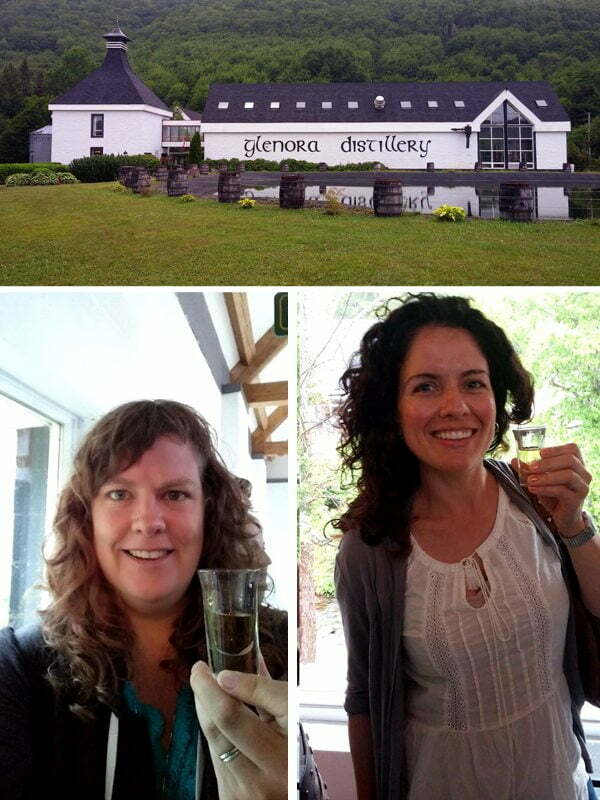 And of course one will find a distillery here, the Glenora Distillery. 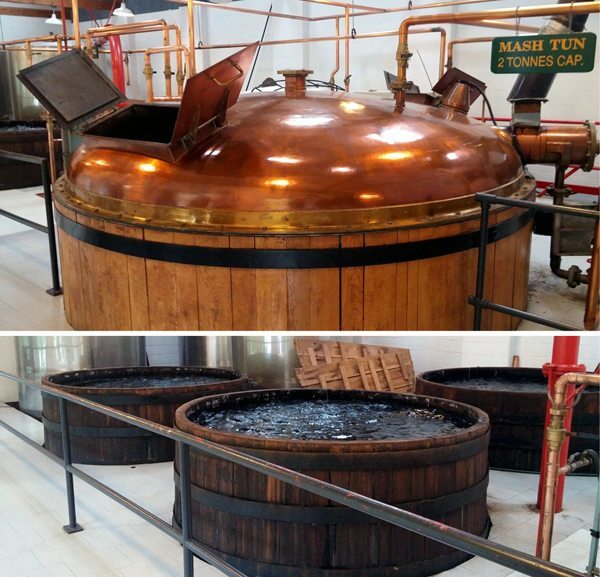 Enjoy a dram of fantastic singe malt Whisky as you tour the distillery (technically a Scotch but since it is not made in Scotland can’t be called that). No, we are not alcoholics. 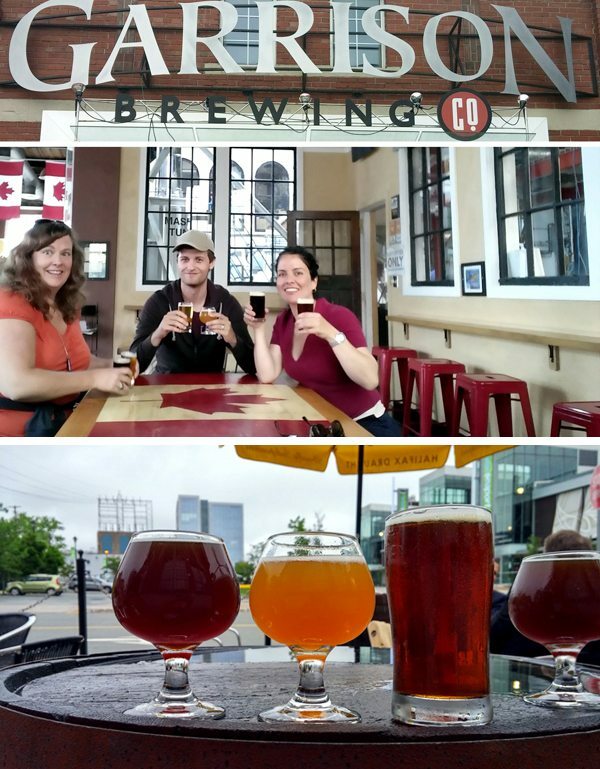 But yes we did start our tour of Halifax at the Garrison Brewery with our new German friend who stayed also at our airbnb. Oh no, a few hours of rain. 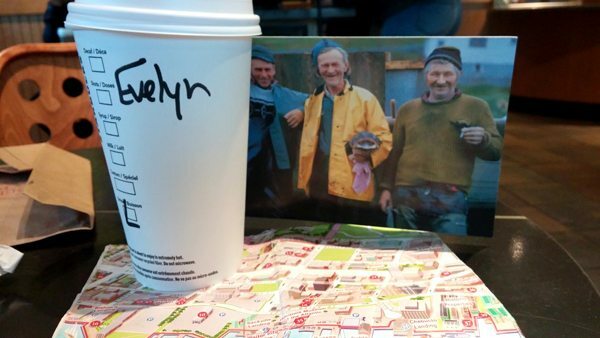 At one point it it was hard enough to impose a Starbucks stop. Great time to write a postcard! I hate it when they do not put the ‘E’ at Evelyne! 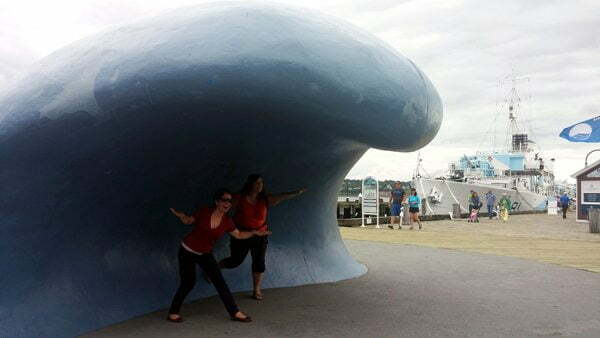 Back on track in Halifax as we go with the flow and ride the wave! 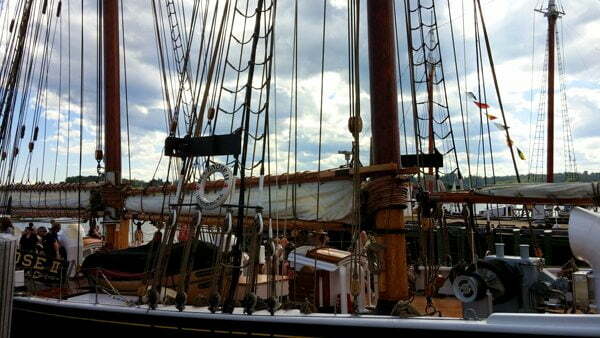 If you like coastal cities, consider visiting Portland Maine as well. 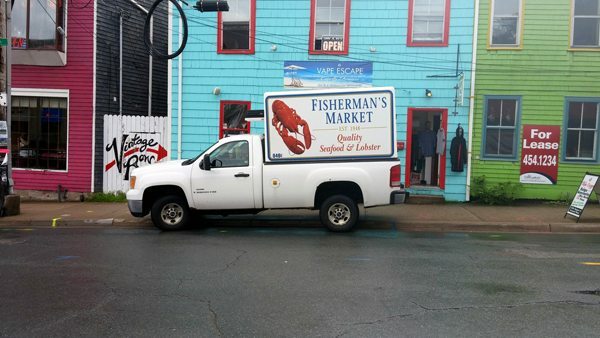 Cute shops on cute street with a lobster truck! So Maritime! 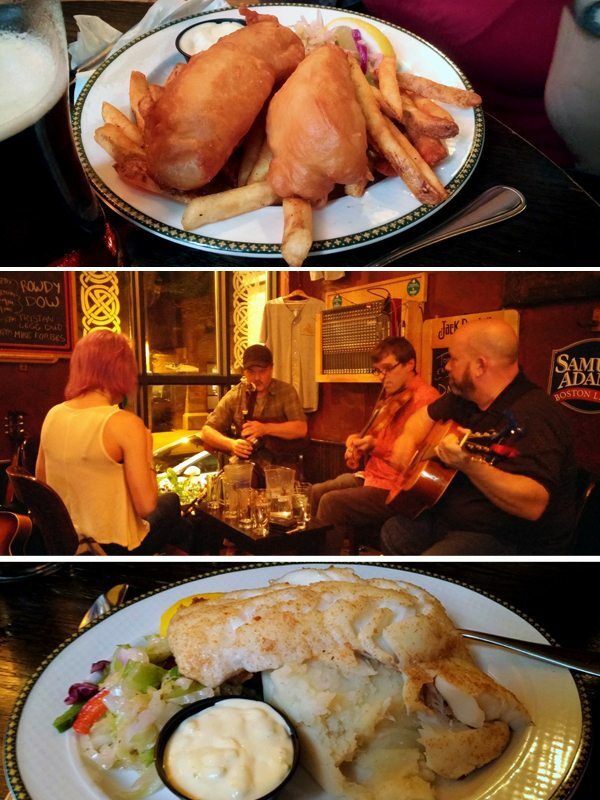 After so much walking we enjoyed a well deserved dinner of haddock and fish and chips with pints, followed by a traditional Irish Open Sesuin at the Old Triangle Ale House. And the geological wonder on which the lighthouse rests. 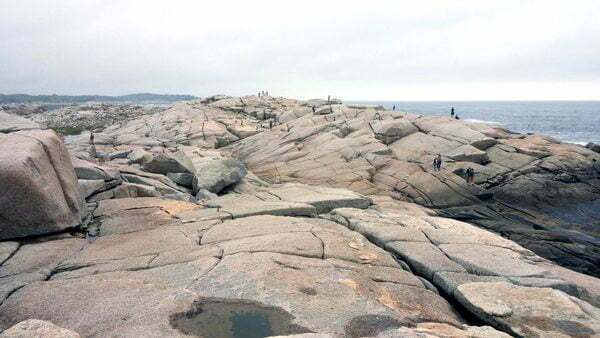 You can stroll along this rocky shore for hours, 400 million year old boulders brought here 10,000 years ago by the melting glaciers. Out of 4 beach visited, Hubbards is the one where the sun dared to show it’s face and the waters warm (barely) enough for swimming! 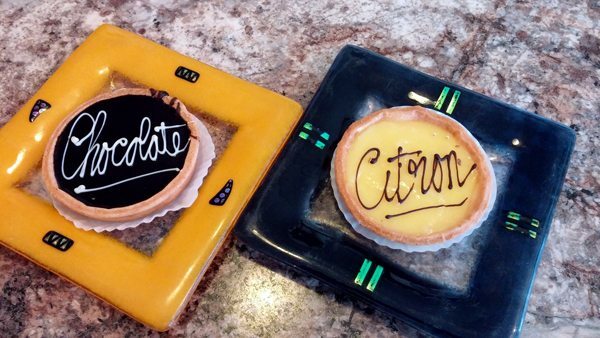 Simple little bakery in Chester but what a cute dessert combo we enjoyed. 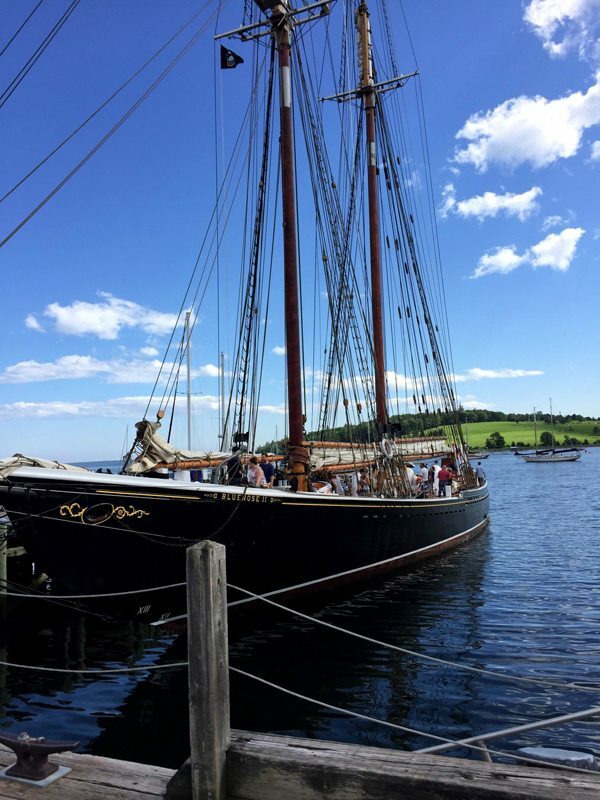 The famous Bluenose II docked in the port town of Lunenburg, a UNESCO World heritage Site. 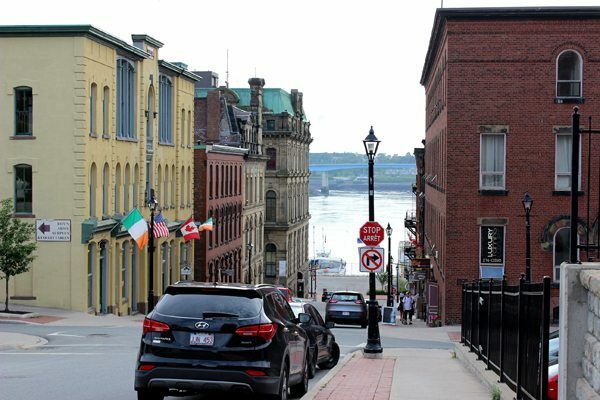 Lunenburg’s unique architecture and civic design, it is the best example of planned British colonial settlement in Canada. And guess what, there is an awesome distillery here too! 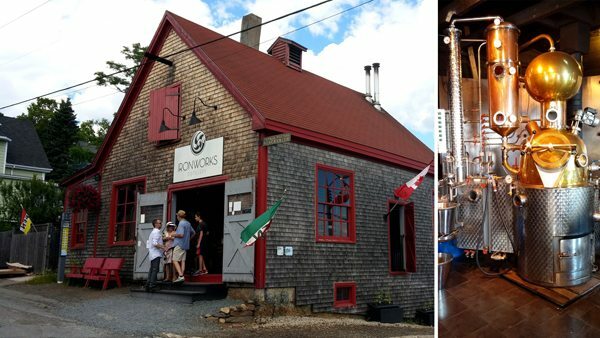 The Iron Works Distillery proudly samples and sells lovely rums, gin, vodka, brandy, tart liqueurs and pear eaux-de-vie. Another well deserves lobster and giant scallop dinner at the Boardwalk Cafe in Digby. Get a spot on the terrace and enjoy a view of sailboats coming in at sunset. 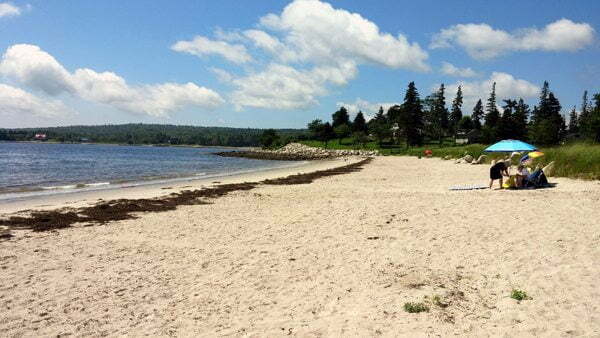 Digby is on the north interior of Nova Scotia, close to the opening of the Bay of Fundy. Trust your nose, this is a cute but very operational fishing town. Digby is famous for scallops! We met a few locals fishing for mackerel right of the pier next to all the fishing boats. Digby was just a pit stop to board a ferry the next day. 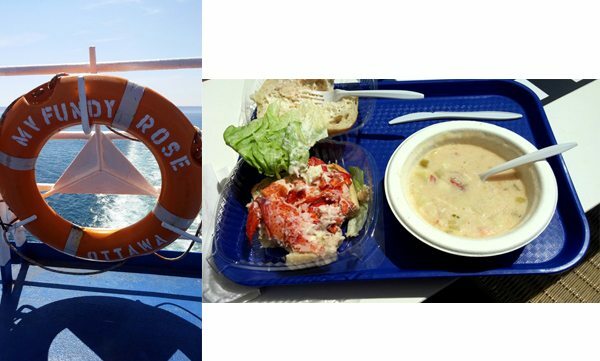 The 3 hour ferry actually served the best seafood chowder of the trip and a well loaded lobster roll to boot. By the time lunch was done we had accosted in Saint-John New Brunswick. 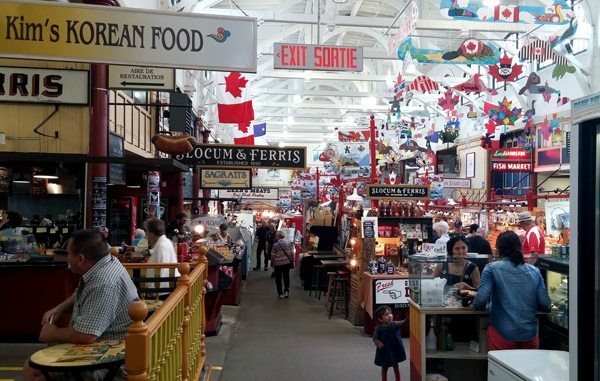 Only half a day to see Saint-John. It is very small and little to explore. I do recommend visiting the period Loyalist House. 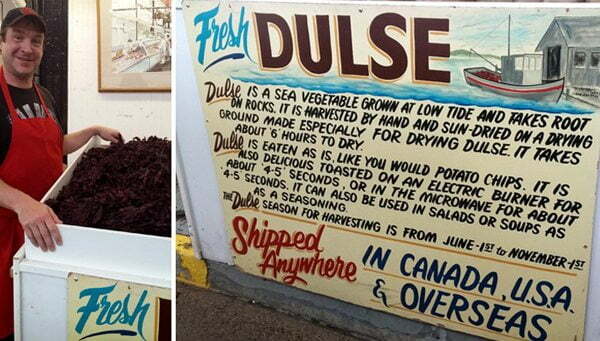 …where we found fresh dulse finally. Check out my Dulse Pull Apart Rolls with Chia, Flax and Sesame Seeds to learn more about Dulse! Probably the poorest place we visited but ironically also where we had our most expensive and gourmet dinner. 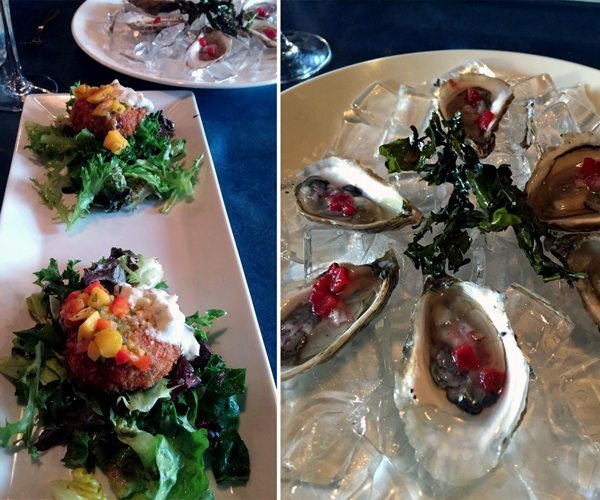 Oysters and crab cakes to start…. 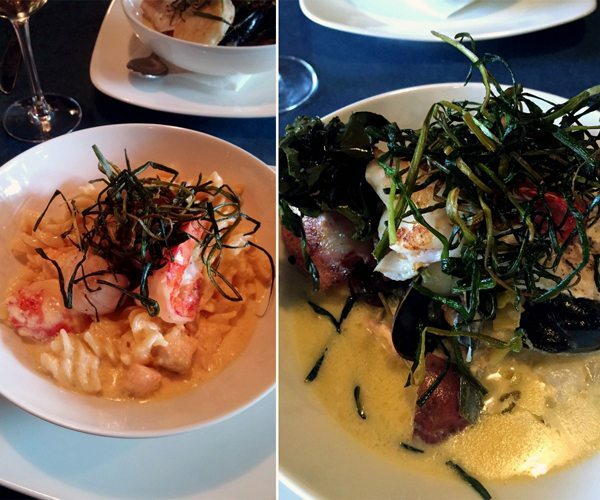 …followed but the Seafood pasta and Shellfish stew mains. Thumbs up for Billy’s Seafood Restaurant! 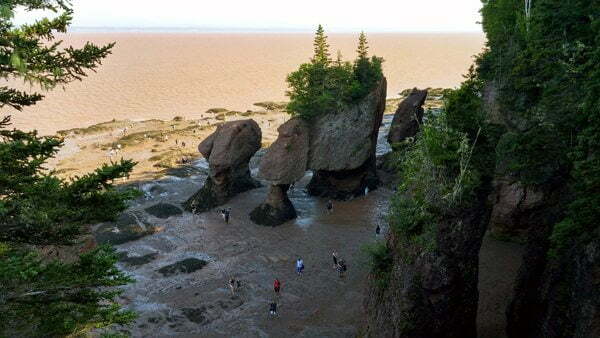 Alas, here is our last tourist day crowned with my most await attraction: the Bay of Fundy famous the the world’s highest tides. 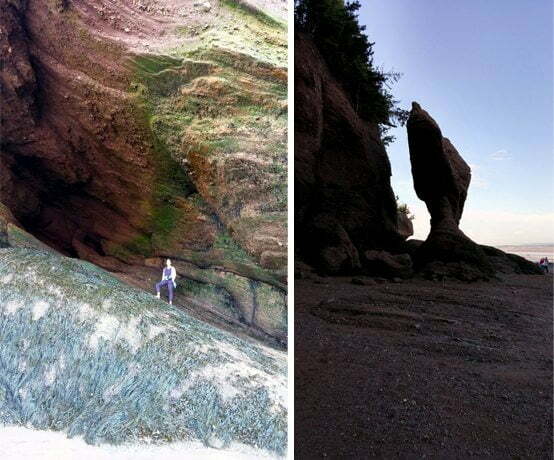 Top pic is High tide and just below is Low tide at the Flower Pots at the Hopewell Rocks. 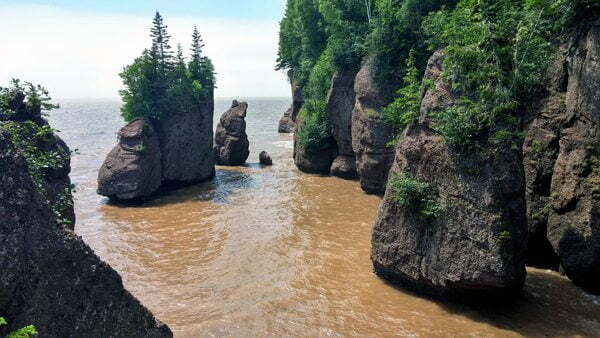 I have waited 25 years to visit the Fundy Bay, ever since they mentioned it in geography in 8th grade! 160 billion tonnes of water moves in and out each day and here the tide mark is 10 meters (30 feet). This allows us to walk the ocean floor at low tide. 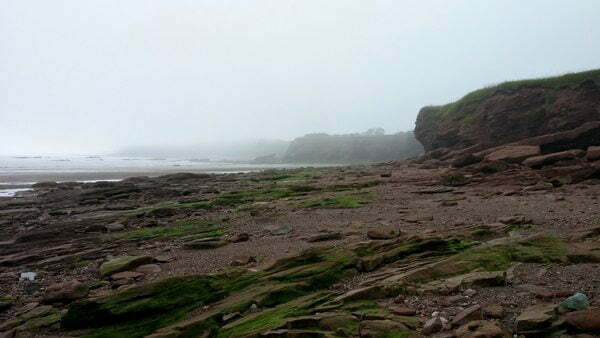 In between tides we explored a partially fog trapped scenic route where we sipped wine at the Waterside Winery and walked a rocky beach where we were walled in on 3 sides by mist. Very cool and eerie. 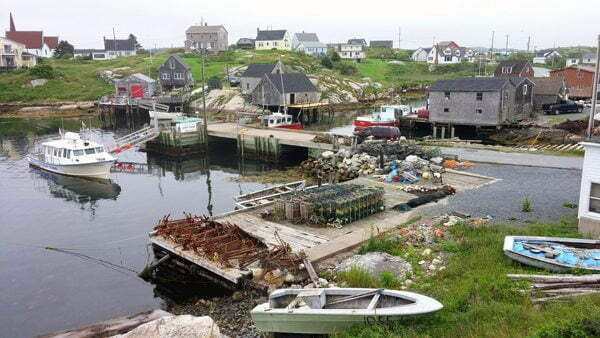 The last supper, the last lobster, the BEST lobster, right from the dock and patio of the Alma Lobster Shop. One last moose sighting! Oh no wait that is me in a moose hat. 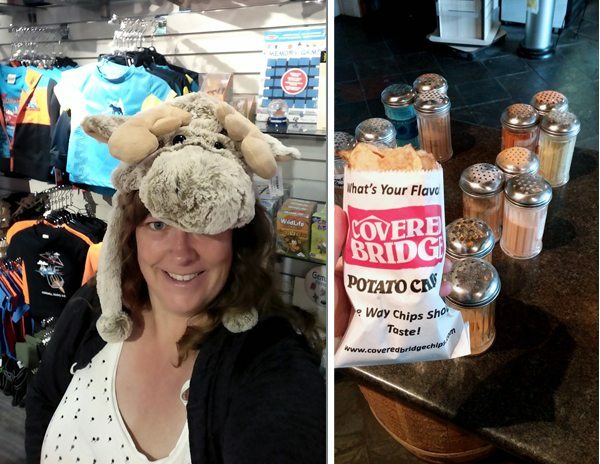 And our last food stop on our way back home, fresh made chips at the Covered Bridge Potato Chips factory in Hartland NB, named for the local and longest covered bridge in the world. Another 6 hours on the road till home! Glad you corrected the title. 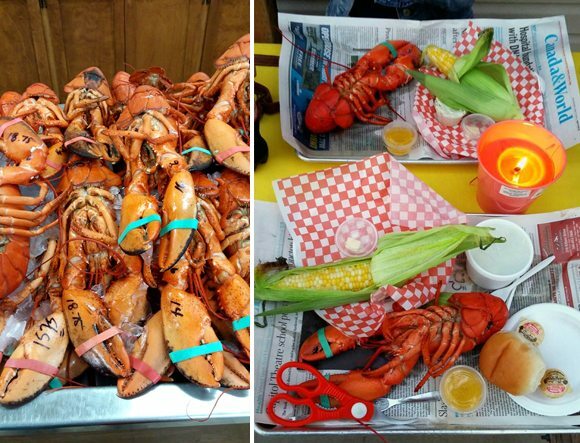 I didn't think an overdose of lobster was possible. :) Looks like a fun trip full of lots and lots of different things to do. Love your pictures!! Always a good thing to find your moose inner self. ;-) Fun pictures, great read -- thanks! 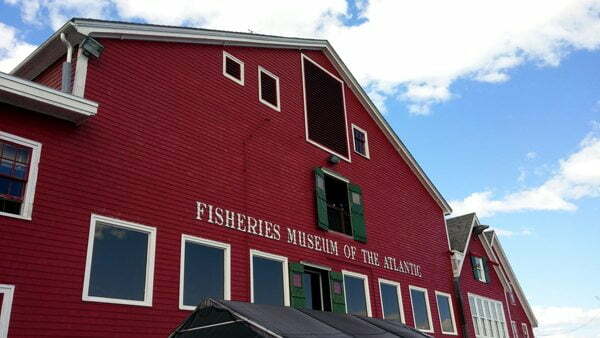 So the only place you didn't eat any lobster was along the Cabot Trail? lol Inspirational! Susan I had my first lobster on the Cabot Trail in Baddeck :-) The 2nd and only other night I did not, I had a haddock filet. Ha ha Kia love it! 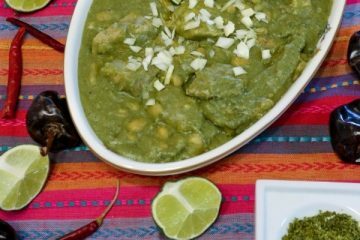 You just mentioned the very few seafood items you liked recently I thought you would not like this post! Now go have lunch! Thanks Amira, yep the moose are popular! 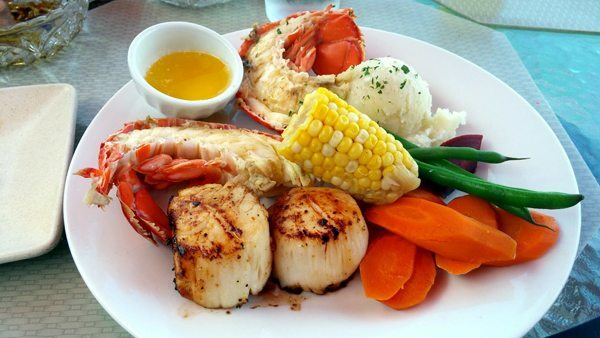 Oh I would so much love a lobster overdose! Love your hat haha! Such a beautiful trip! Um, but can you REALLY overdose on LOBSTER??!?!?! Wow you saw a moose family! That's wonderful. I love visiting Canada. It's so different depending on which are you go to. 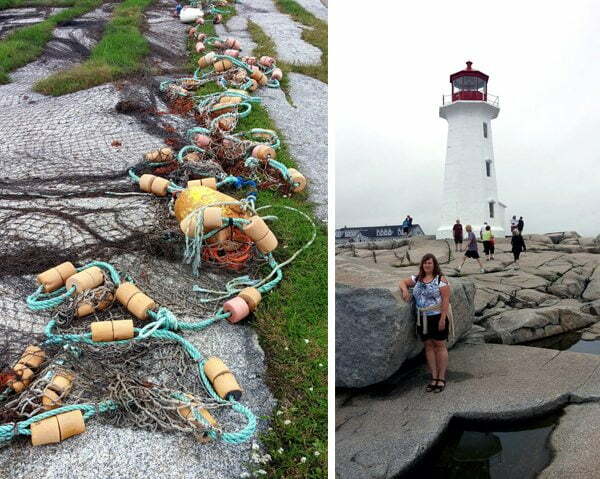 Loved this look back at Nova Scotia. We did some similar things but didn't do the things in the last part of your post. Next time hope you explore the last part Lorraine!